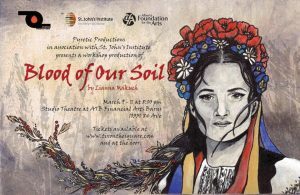 St.John’s Institute is proud presenter and Executive Producer of Lianna Makuch’s Blood of Our Soil. Blood of Our Soil by Lianna Makuch is a world premiere performance. Blood of Our Soil depicts the struggles of the Ukrainian people against the atrocities of Stalin, to the horrors of Hitler, while drawing disturbing parallels to the current Putin regime. A poignant and personal production, Blood of Our Soil integrates dramatic storytelling, live Ukrainian folk music, a fusion of Ukrainian and contemporary dance, and a projection design that paints a landscape of both beauty and terror. Blood of Our Soil tells the story of Hania, a Canadian woman, as she reflects on fond memories of summers spent with her beloved Baba (Ukrainian for grandmother). After a chance discovery allows her to gain new insights about her Baba’s struggles during WWII, Hania is compelled to gain a deeper understanding of both her personal and cultural history. She travels to her ancestral Ukrainian homeland, exploring both its beauty and its traumas. But Hania is not prepared for what she discovers as she understands the full impact the conflict has had in Eastern Ukraine. Inspired by the actual experiences of the playwright’s grandparents, and the true accounts of interviews conducted in the conflict zone of Eastern Ukraine. Blood of Our Soil reveals personal stories which span generations at the heart of political turmoil: from WWII to the hybrid conflict currently raging in Eastern Ukraine. Blood of Our Soil gives voice to the voiceless people whose lives have been affected by the frozen conflict in Ukraine, Europe’s current “forgotten war,” where current Russian aggression has killed more than 10,000 people, and displaced millions.